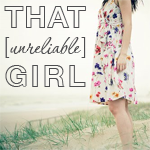 THAT [unreliable] GIRL: Contemporary Crochet - Oxymoron or Ingenious Innovation? 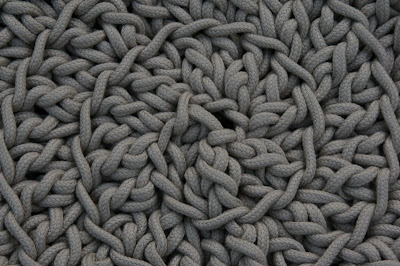 Contemporary Crochet - Oxymoron or Ingenious Innovation? I vote the latter. And with that, it's official. My two formerly separate worlds of all things modern and all things handmade are now one and the same. 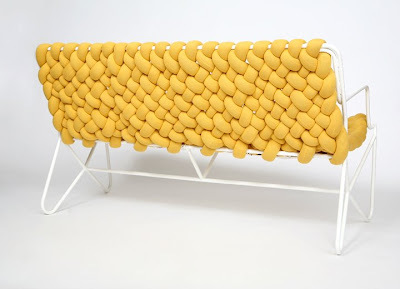 Just when I was beginning to get over my phobia of display plates, it appears that all things knitted, weaved and crocheted are making a resurgence too. Not that it hasn't been a long time coming, celebrities have been flashing around their knitting needles for quite a while, and even your grandma was in on the craze before you were. 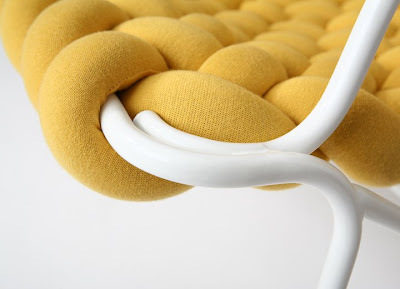 So it's no surprise that earlier this month at the Stockholm Furniture Fair, it was the unlikely union of tubular steel and weaved textiles (clothed polyurethane foam to be precise) that grabbed the attention of many. The design of new architecture/design trio Imaginary Office, the Pleats-Pleats Sofa is an unexpected combination of precision steel and squishy handicrafts. Outdoor furniture is in on the craze too. 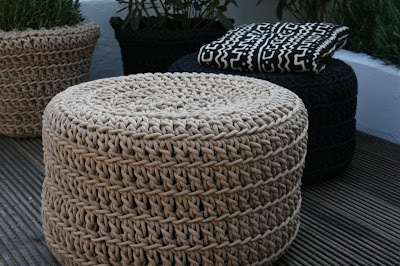 These crocheted poufs from Ineke Visser are made from UV resistant polyester yarn that is reportedly as soft as cotton. 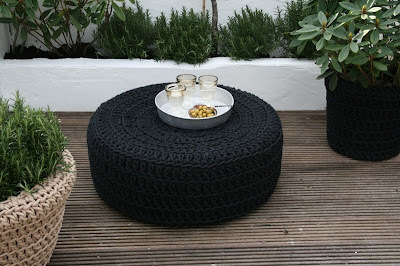 Perhaps even less expected than weaves and tubular steel however, these pouf covers are designed to be pulled over rubber tyres. 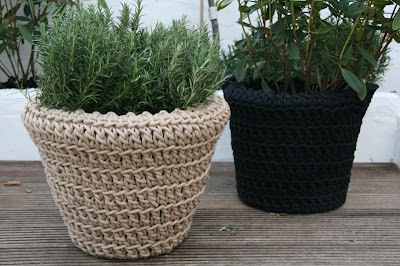 In the event that this isn't an ingenious means of reusing car tyres, Ineke has also designed crocheted pot plant covers to even out the green scorecard. 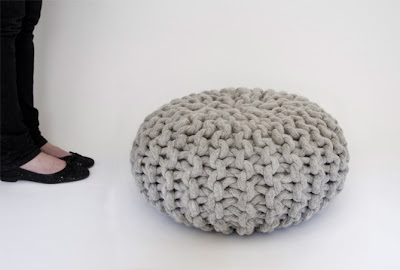 This latest trend for handicraft/homeware hybrids wouldn't come as any surprise to Rotterdam-based Christien Meindertsma, who has been creating hand knitted poufs under the banner of FLOCKS for the last few years. 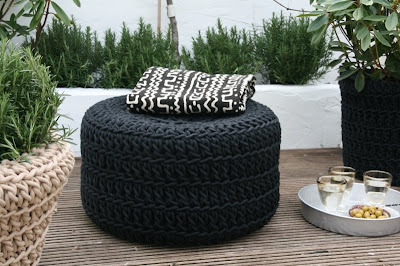 Christien collaborates with knitters, spinners, farmers and felters from around the world to create her bespoke range of knitwear, and although she focuses primarily on fashion, her hand felted, hand knitted poufs are practically a classic. 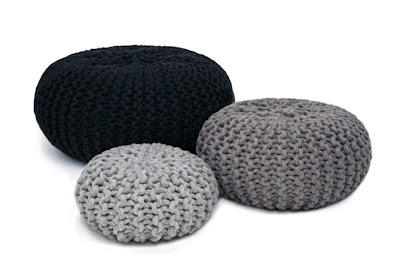 Yes, a classic pouf. You heard it here first. 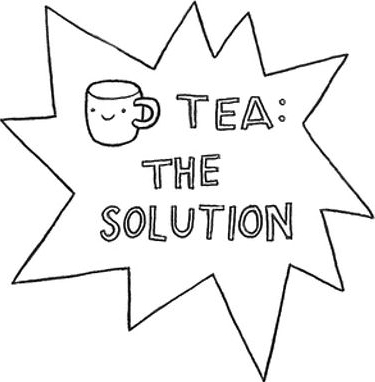 And you're absolutely right. Grandmas and A-Grade knitting celebrities alike would be hard pressed to fight back feelings of severe knitting needle envy. Can you imagine trying to get these puppies past customs? "I swear Mister Airport Customs Man, they're knitting needles. I make poufs. NO didn't call you a...oh dear, cavity search you say?" So maybe leave your massive knitting needles at home, but get your hands on a weaved sofa, a knitted pouf and a crocheted pot plant, and while you're at it, hang your favourite plates on your walls too! Everything old is new again, and Grandma would be proud. oh that first chair is fantastic!!! I am so glad you posted the pic of the artist at work...these are wonderful! love that yellow chair. those needles are huuuge! Ahh! 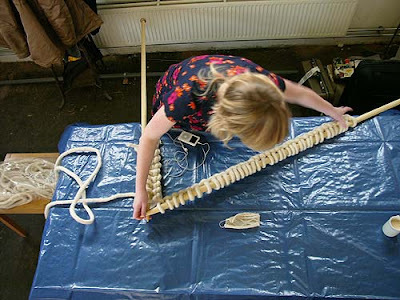 I can't even imagine knitting with needles that big! 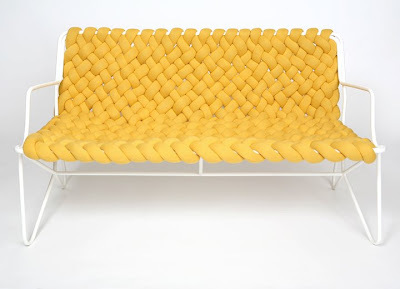 And that "yarn" making up the first sofa looks so very very comfy. my mum crochets like a bandit - i'll have to tell her it's cool. 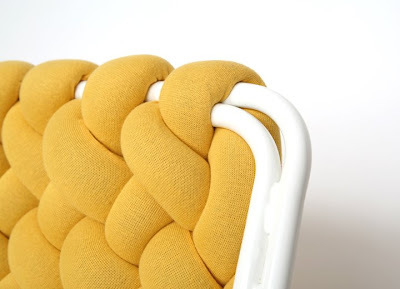 i love the fat weave on the yellow chair. krystyna81 - The sofa looks so super comfy, doesn't it? Although I'm not sure it would stand up to the very scientific "Jumping on the Couch" test. L. - Me too, I really want one! The needles are kinda scary aren't they? They'd be a good workout though! Mallory - Hehe me either, I showed Mr. Unreliable and he didn't even think the picture was real! My 8mm needles no longer feel so superior!